LOS ANGELES -- The Boston Red Sox are the 2018 World Series champions. 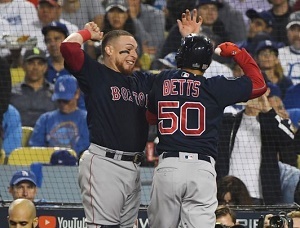 Needing a win Sunday to finish off the Los Angeles Dodgers, the Red Sox scored two runs in the first inning to take an early lead and would never relinquish it en route to a 5-1 victory in Game 5. Postseason hero Steve Pearce clubbed Clayton Kershaw’s sixth pitch of the evening over the left-field wall at Dodger Stadium, and Los Angeles never recovered. He added a solo homer in the eighth inning. After allowing a home run to David Freese on his very first pitch of the night, David Price took over. The 33-year-old lefty cruised through seven-plus innings, mixing four- and two-seam fastballs with his reinvigorated changeup to flummox the Dodgers’ lineup as it faced elimination. A solid effort from Kershaw, who may have pitched his last game in a Dodgers uniform, could not quiet the Red Sox bats. Though Kershaw kept the Boston off the board from the second through fifth innings, solo homers by Mookie Betts and J.D. Martinez in the sixth and seventh innings, respectively, padded the Red Sox’s lead as they steamrolled through yet another postseason opponent. Boston lost only three games in October, winning 11 of 14 postseason contests. They bested the 100-win New York Yankees in a four-game American League Division Series, beat up on the 103-win Houston Astros in a five-game ALCS, and made quick work of the National League champion Dodgers in the World Series. The Dodgers’ only win of the series game in Friday’s 18-inning Game 3. Price, who had never earned a win in 11 career playoff starts as of Game 2 of the ALCS, took his third straight postseason win in the clincher Sunday. "Very special. To see all these grown men over there acting like kids is what it's all about," Price said on the field as his teammates celebrated around him.